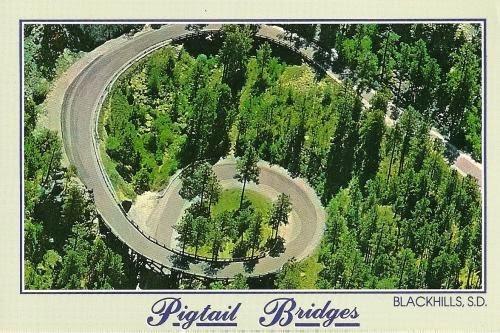 Postcard US-2711416 from Minnesota shows an aerial view of two pigtail bridges and one of the tunnels on Iron Mountain Road, ascending 17 miles or 27 kilometers from Custer State Park to the entrance of Mount Rushmore National Memorial, in the Black Hills, Rapid City, South Dakota. Drivers will get a 360° panorama of the area that has many unique and beautiful scenic roads. Jess Stryker has a Youtube video showing driving through the one-lane tunnel, horseshoe curve, and 360° loop over and under one of the pigtail bridges. The Mount Rushmore came into view when exiting the tunnel.